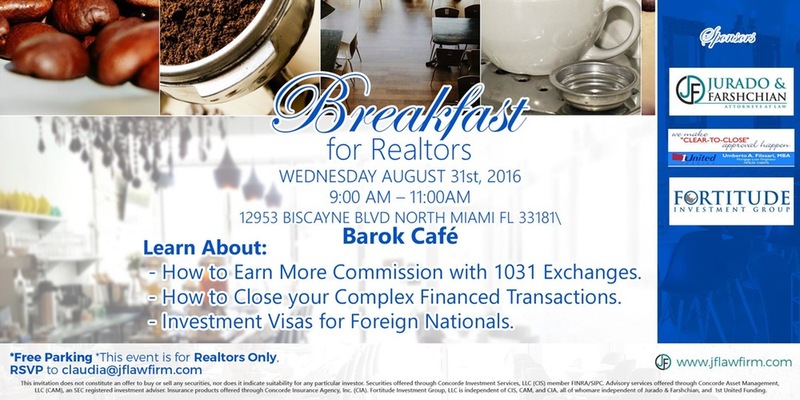 We would like to invite you to our free educational breakfast event for Realtors. Come join Jurado & Farshchian, P.L., Fortitude Investment Group & 1st United Funding for a morning filled with information and ideas geared toward helping you grow your Real Estate business. – Investment Visas for Foreign Nationals. – How to Earn More Commission with 1031 Exchanges. -How to Close your Complex Financed Transactions.